Re-calibrating the stock RX-7 tach for V-6 or V-8 use is a fairly straight forward process that involves dis-assembly of the dash, and removal of the tach assembly. The 1st step is to remove the whole dash pod from the car. There are 2 harness connectors to dis-connect from the rear, as well as the speedometer cable (a retention tang must be compressed to dis-connect the cable). After the pod is out, the dash face can be removed, usually attached with 4 phillip's head screws. 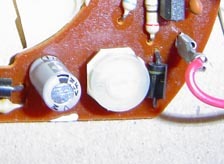 Then the tach itself can be removed from the front of the main dash circuit board by removing the screws or nuts on the back side that connect it to the circuit board (depending on the model). Try not to leave any fingerprints on the satin black inner part of the dash face, as they are quite hard to remove. After the tach is removed from the dash, it must be wired up to a signal source, usually done by using 3 long jumper wires w/ alligator clips. 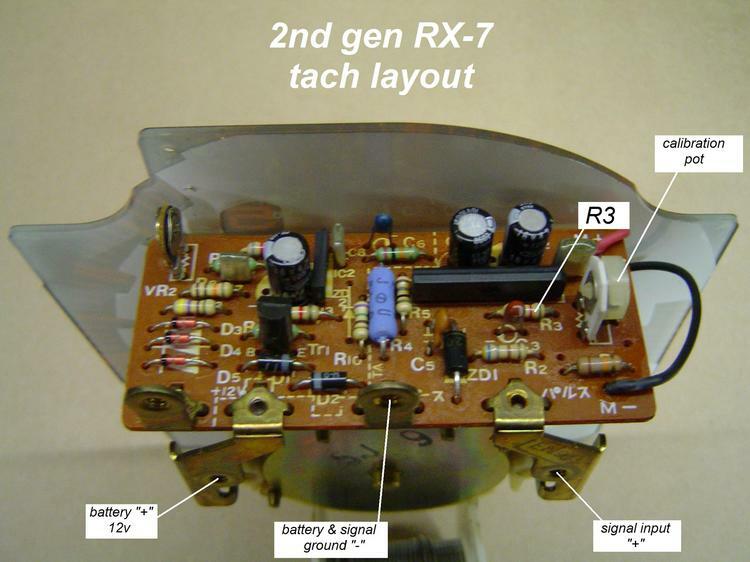 There are 2 different layouts used for the 1st gen tach, one that is connected to the dash circuit board with wires, the other with studs and nuts to make the connections. "trigger" wire is the black w/ yellow stripe. "ground" wire is the white w/ black stripe. #1 is the signal, or "trigger" as I call it, usually attached to a coil negative (-). #3 is the 12v +, usually hooked to a keyed ign. source. 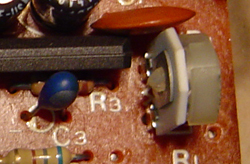 The upper extreme left connection, which looks like a simple round eye for attaching a screw, is for the over-rev buzzer, and not connected to anything during the re-cal process. The upper right connection, which also looks like a simple eye, is the ground terminal. 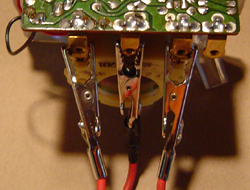 The lower left connection, which looks like a flat formed strip with a notch cut in it just below and to the right of the screw hole, is the "+" connection, which is connected to 12v. 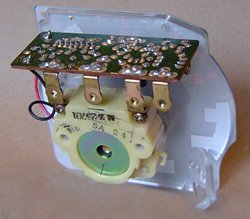 The lower extreme right connection, which also looks like a flat strip except with a notch just below and to the left of the screw hole, is the "signal" connection that typically hooks to the coil "-" on a standard ign, or the "tach" terminal of a GM HEI distributor. 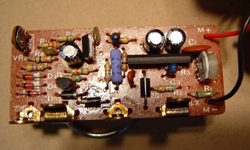 PREFERRED SIGNAL SOURCE...an inexpensive 12v battery charger can be used as a deadly accurate signal source for the re-cal of your tach. This signal source is so steady and accurate that there is no need to compare the reading with another V-8 calibrated tach. Battery chargers typically use a rectifier bridge to convert the AC power source into DC. This turns the 60 hertz sine wave input into a 120 hertz ripple wave DC output. The ripple wave output is be read as 3600rpm by the stock rotary calibrated RX-7 tach. 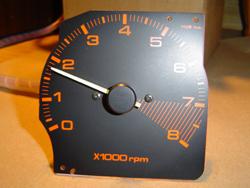 For a V-6 application, an RX-7 tach should be adjusted to read this signal as 2400rpm. 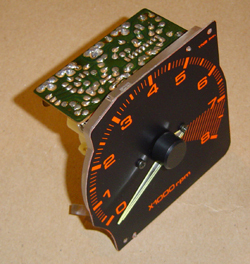 For a V-8 application, adjust your RX-7 tach to read this ripple signal as 1800rpm. Please note that you must use a 12v battery for a power source, and the battery charger as a signal source only. The ground wires for both the battery and the battery charger should be connected to the ground terminal of the tach. NOTE: Be sure that the RX-7 tach is about the same orientation as when installed, because the re-calibration may be off if done with the face in a horizontal plane. Use the test leads to hook-up your RX-7 tach to the signal source and power source as described above. With your signal source plugged in and your un-modified tach wired as above, it should be putting out a reading of about 3600rpms. To correct your RX-7 tach's reading, the cal-pot must be adjusted. 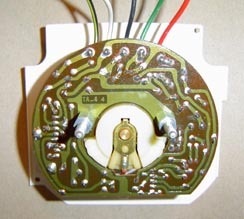 It is a round white adjustable potentiometer located on the end of the circiut board. The adjustment is secured from the factory with a locking compound, so your initial turn of the adjuster will be difficult until the locking compound's seal is broken. Be patient, and don't break anything. When you get the adjustment free'd up you will be able to observe the effects of adjustment on the RX-7 tach's needle. Try to adjust until the tach reads correctly for your application (2400rpm for V-6, 1800rpm for V-8). If you don't have enough adjustment to get the correct reading, the value of the cal-pot must be altered. The method I use is to add a 1500 ohm resistor in parallel with the resistor BEFORE the cal-pot (usually marked R3). I usually add this resistor to the backside of the board (the side with the solder joints) to make things easier. 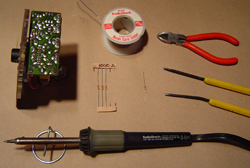 The 1500 ohm resistor will get the calibration close enough that minor adjustment of the cal-pot is all that is needed. After adding the resistor, repeat the process. Now, the cal-pot should have plenty of range. "My test rig does not operate the tach..."
...Most likely, your battery charger is too good. The more expensive chargers have filters that remove too much of the voltage ripple while converting to DC. 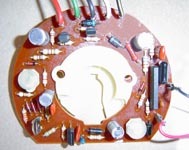 The needed cheap battery charger uses only a rectifier bridge to hack the AC into DC, resulting in a distinct ripple instead of a true straight-line DC voltage. You need to use the cheapest of the cheap chargers. "My tach needle does not rest at zero..."
...The tach needle is a light "press-fit" on it's shaft. Simply forcing the needle against it's internal shaft stops will spin the needle on it's shaft. To re-index the needle, just lightly twist it against the shaft stop in the opposite direction. "The 1500 ohm resistor does not give my cal-pot enough range for re-calibration..."
...In rare instances, we run into a tach that will not calibrate with the standard 1k resistor. In those cases, we substitute a 4700 ohm resistor in place of the 1500 ohm unit we typically add. This usually does the trick. If you have any problems with the above process, feel free to contact me, or you can send your tach to me for the modification (we usually have re-cal'd tachs in stock and ready to ship on an exchange basis). Normal turn-around is 1 day.